↑ BirdLife International (2012). "Phalacrocorax carbo". IUCN Red List of Threatened Species. Version 2012.1. International Union for Conservation of Nature. http://www.iucnredlist.org/apps/redlist/details/106003679। আহৰণ কৰা হৈছে: 16 July 2012. ↑ Ali, S. (1993). The Book of Indian Birds. প্ৰকাশক Bombay: Bombay Natural History Society. ISBN 0-19-563731-3. ↑ Ribak, Gal; Weihs, Daniel; Arad, Zeev (2005). 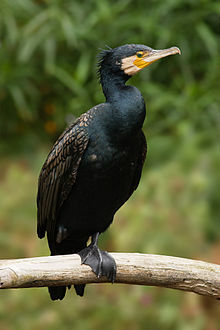 "Water retention in the plumage of diving great cormorantsPhalacrocorax carbo sinensis". Journal of Avian Biology খণ্ড 36 (2): 89. doi:10.1111/j.0908-8857.2005.03499.x. 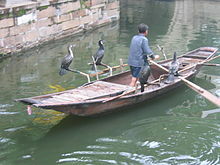 ↑ "Phalacrocorax carbo Albino (Great Cormorant, Great Black Cormorant)". MCH Portal: The Art and Science of Fishkeeping. June 14, 2011. http://www.mchportal.com/photography-galleries/macro-and-nature-mainmenu-52/birds-mainmenu-54/869-phalacrocorax-carbo-cormorant-albino.html। আহৰণ কৰা হৈছে: June 27, 2011.